A wonderful & rocking performance by Yashita. This year if any contestant deserve most to win than without a doubt only she is. The performance was excellent and I really enjoyed that. But I didn't get the point why all the judges gave Super Hit. Pritam said, " Attention, energy, sur got messed up". I would just like to know exactly where!!!! An excellent performance. her rendition was really very good. A very good & brave attempt but not best. IMHO, he could do much better. This girl is really improving day by day. I really enjoyed the performance. But she still has to learn a lot. Wow, what a performance. Simply wonderful & mind blowing. Cmon judges. How more biased you all will be. It was not even very good performance but despite he got all history. To me he is the most over hyped contestant of the universe. He lost the rhythm in so many places which Shankar also admitted but got history. A very good performance but not an excellent one. She could do much better. Believe me, not for the people's vote the reason Asma still competing in the show. These are all pre-scripted. Who has to leave, who has to stay all decided by the Zee team. Peoples vote are only to earn money through the mobile companies based on SMS & calls and an eye wash. Same for Debojeet - The Voodoo King. You are right, Asma could not hv got so many votes. In Big Boss too the channel is deciding the eliminations and in Saregama too we are seeing the same thing. 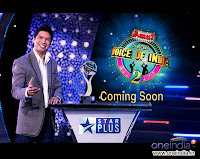 VOI is slightly better than saregama, since in VOI there is still some suspense on who will be the winner, but in saregama we know the winner - Debojeet Dutta, unless the channel producers decide to surprise the viewers and declare Asma the winner in the end.